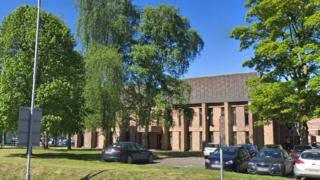 A tree preservation order in Wrexham has been approved despite a warning the town could lose its magistrates court as a result. Cases have been moved to Mold because the closure of the nearby police station means no cells are available. Plans to build a new custody suite at the court are being prevented by the trees, Labour MP Ian Lucas has claimed. Planning chair Mike Morris said: "We're not stopping a custody suite - what we are doing is safeguarding the trees." Labour councillor Paul Jones told Wrexham council planning committee the town risked a "significant loss" of professional jobs associated with the court, the Local Democracy Reporting Service said. "All over England and Wales magistrates courts have been getting closed," he said. "My concern is if we put the tree preservation order on here and make it too restrictive for the Ministry of Justice, it provides justification for them to withdraw from putting custody cells on that site. "The longer the work is taking place in Mold, the less likely we will retain our magistrates court." Defending the order, Mr Morris said: "No-one is wanting to preclude a custody suite at the law courts. "We're all in favour of that in order to enhance the service they provide and maintain it. "It's not as straightforward as some of the things reported in the press about it being the council's fault." The majority of councillors voted in favour of approving the order, subject to another tree in the area, which was not previously included, being added in.